European Union nations are leading a bailout of that government in an attempt to prevent other financially troubled EU members such as Spain and Portugal from collapsing as well, which could bring down the entire European Union financial system. The list of states and municipalities in desperate financial shape continues to grow. The state of California is right behind Greece on the sovereign debt-watch list and is effectively insolvent. The Wall Street Journal reported last week that “Illinois lawmakers were in disarray Thursday as they groped for stopgap measures to address a $13 billion deficit equaling nearly half of the state’s general fund revenue.” You read that correctly – state debt is nearly 50 percent of state revenue in Illinois. The Journal article also points out that “the state’s backlog of unpaid bills probably will exceed $5.5 billion at the end of June.” According to the Journal, Illinois Gov. Pat Quinn’s proposed solution to his state’s debt problems includes raising the state income tax by 50 percent from 3 percent to 4.5 percent. Given the fact that we are in the midst of the most serious national recession since the time of the Great Depression, it is understandable that tax revenues are down at every level of government. The Journal reports that Illinois’ revenues in April are 15 percent lower than they were a year ago and that personal income “tax collections” in California are 30 percent lower than their projections. 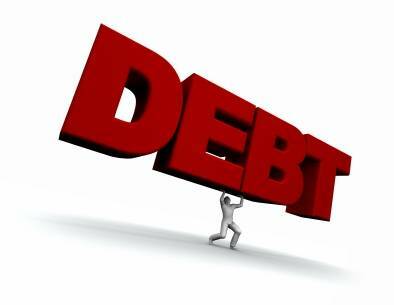 John Riley of Cornerstone Investments has warned of the dangerously high levels of debt in relationship to our GDP. Riley points out that debt to GDP (that includes all debt – corporate, consumer, and government debt) was 91 percent in 1981, 300 percent in 1930 at the height of the Great Depression, and is nearly 400 percent today. Those are unsustainable debt levels. While consumers and corporations are tightening their belts and cutting costs during these difficult economic times, the federal government continues to spend money it doesn’t have in ever increasing amounts. For example, Congress raised spending levels for itself and its institutions this year by 17 percent even though the federal budget deficit is expected to be in the $1.5 to $2 trillion range this fiscal year. Meanwhile, our trade deficits are on a pace to exceed $600 billion. Before the housing bubble burst, Charles Prince (who was then the CEO of Citigroup Inc.) was asked by the Financial Times in 2007 about the economic bubble fueled by loose lending standards and excessive credit. His response: “So long as the music is playing, you’ve got to keep dancing.” The music ended for Mr. Prince shortly thereafter. The music will end for the Washington, D.C. big spenders as well. The next debt bubble to burst is the government debt bubble. It is only a matter of when – not if – that will happen. The Texas state government is in better shape financially than any large state in the nation, having balanced its budget and put money away in a “rainy day” fund in case the national economy got worse – which it has. Nonetheless, Texas also is feeling the effects of this recessionary environment as tax revenues decline. Gov. Rick Perry and our legislative leaders are trying to stay ahead of the problem by calling on state-funded agencies and institutions to prepare for spending cuts in advance of the next session of the Texas Legislature. Meanwhile, federal officials seem to be unprepared for the coming day of reckoning as a result of this explosive growth in government debt. The federal budget for Fiscal Year (FY) 2010 increased by $410 billion from FY 2009, a growth in overall federal spending of more than 13 percent in a single year. Washington, D.C. policymakers need to quickly agree on a bi-partisan plan to reduce federal spending and to do “more with less.” The federal government has been acting a lot more like California than Texas in recent years when it comes to spending excesses. Unless our elected officials change course soon, the problem will only get worse. The bigger that government debt bubble gets the worse the consequences for our nation will be when it finally bursts.